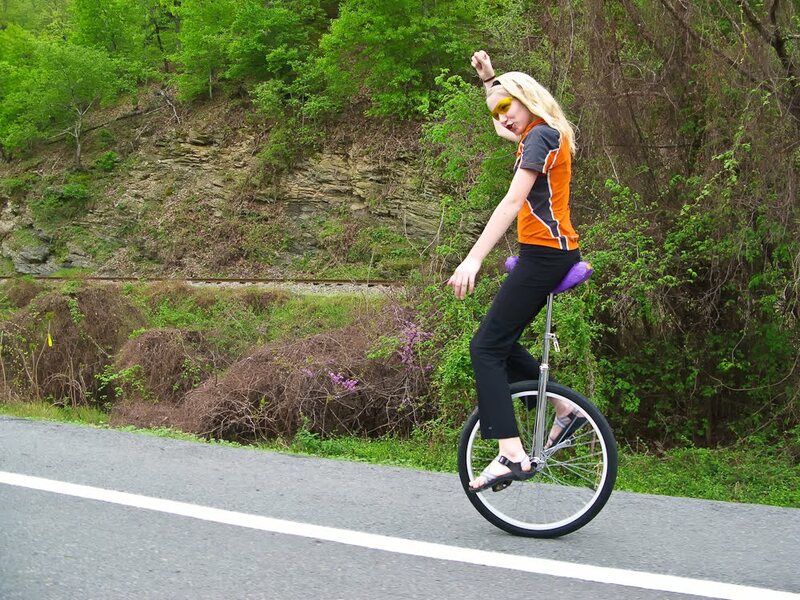 While we adults have been fiddling with our bikes lately, Mandy has been happily practicing on her unicycle. (And also getting straight A's in all her classes. And also applying for and being accepted to 7th grade Advanced Art for next year. And also deciding to be a National Geographic photojournalist when she grows up. So she's been busy.) But back to the uni: she's quite good now at controlling her direction and at going up and down hills and at riding on grass. Today she asked if we could go to the River Trail a little early, because she wanted to see if she could ride a whole mile on the uni. Bryan rode alongside her with the GPS so that she could establish the mileage. When he told her she'd reached a mile, she still felt fine and decided to try for two miles. She was thirsty so I handed her a water bottle as she rode by. She handed the drink back the next time she passed me, and a few minutes later completed the two miles at exactly one o'clock, right in front of the assembled ABC riders, who were waiting for Bryan to begin their group ride. Yessss!